There has been no hour like it in history. On the evening of March 5, 1953, between nine and ten p.m. in a dacha on the edge of Moscow, Joseph Stalin died from the effects of a cerebral haemorrhage. Fifty minutes earlier, in a communal Moscow apartment, Serge Prokofiev died after suffering a stroke. The congruity is unparalleled - indeed, it could only have been matched had Shakespeare died within an hour of Elizabeth I or Goethe on the night Napoleon expired. Potentate and artist, tyrant and victim, were uniquely linked by the accident of death. They have remained conjoined ever since. At Prokofiev's funeral there were no flowers: Stalin's men had rounded up all winter blooms. There were few mourners, barely 40, because all attention was directed to the national loss. Three days passed before news of Prokofiev's death leaked to the West, three days more before it appeared in Pravda; still, some got wind of it. The string quartet who played beside Stalin's open coffin wept openly-- for Prokofiev. Within three years, Stalin's crimes were denounced by Nikita Khrushchev at the 20th party congress and the Great Leader and Teacher was consigned to perdition. A slow thaw set in. Alexander Solzhenitsyn wrote about the Gulag; Dmitri Shostakovich codified the Great Terror in his symphonies. Artists who outlived Stalin erased his stain from their work. Prokofiev, who died with him, remains half-damned by association. He is one of the most familiar composers of the modern era. Peter and the Wolf is performed in kindergartens and Romeo and Juliet is not only danced by ballet companies but blared forth in football stadia as an aggressive combat anthem. A composer as popular as Prokofiev cannot reasonably be considered the victim of prejudice. However, these two hits apart, the rest of his output, some 135 works, receives patchy recognition. It is clouded by the unease that we might feel when entering a mediaeval torture chamber, a mixture of faint curiosity and crawling fear. 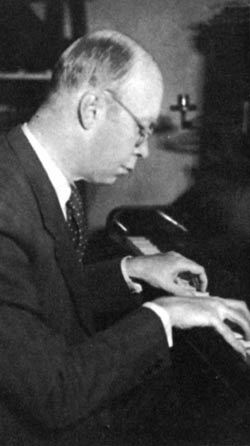 Of Prokofiev's seven important symphonies, only the first and fifth are performed with any regularity; of his five piano concertos, only the third and fifth. How many of us can name, let alone claim to have seen, more than three of his ten operas? How few living pianists play the nine sonatas as a life-work? There is no contention about Prokofiev as there is about Shostakovich (or even Tchaikovsky); no secret messages encrypted in the music, nothing but fertile melody and crackling originality. Nor is there any dispute over his stature. Prokofiev is universally acknowledged as one of the foremost composers of the twentieth century, albeit the least explored. The root of that paradox lies in his frozen embrace with Stalin. Prokofiev, having left Russia after the revolution, returned in 1933 and resettled in 1936, the only genius who was fool enough to believe Stalin's promises of haven. He found creative stimulus in Moscow's theatrical life and intuitive interpreters in David Oistrakh, for whom he wrote two concertos, and the pianists Sviatoslav Richter and Emil Gilels. He enjoyed privileged social status, a comfortable apartment and a country dacha. But in Stalin's first purge, seeing friends disappear, Prokofiev offered a craven cantata for the 20th anniversary of the revolution, a 60th birthday ode, Zdravitsa, to Stalin and sundry hymns to dam projects. Abroad, he was recast as an official propagandist. Time magazine captioned its 1945 cover story: "He keeps time with the Marxian metronome." Foreigners were unaware that his first wife, Lina, and their two sons were being held in Siberia as hostages for his compliance. In Stalin's second purge he was publicly excoriated, deprived of work and reduced to near-starvation while writing the last sonatas about, as Richter said, "a world which had lost its balance". His larder was restocked by the young cellist Mstislav Rostropovich, who barged into the office of Prokofiev's chief tormentor, the Composers Union secretary Tikhon Khrennikov, and warned that he would be held personally responsible if Prokofiev died of want. Khrennikov coughed up 5,000 roubles. When Stalin died, Shostakovich managed to obliterate his forced obeisances in the bitingly laconic Tenth Symphony. Prokofiev, in his grave, could not cleanse himself of compromise. He appears, to the eyes of history, a weak man, over-fond of comfort and lacking in moral courage. Stalin's grin continues to blight a damaged reputation. Attempts in the current fiftieth anniversary year to find merit in his propaganda are misguided. Shouts of "Zdravitsa" (Cheers!) to Stalin at the South Bank and Carnegie Hall will only reinforce the existing linkage and give us an excuse to postpone the hour of our reckoning with Prokofiev. There is something profoundly suspect about Western attitudes to this composer. Instead of subjecting him to continuous critical assessment, we repeat favourite works and shun the rest. Prokofiev makes us uneasy in ways that Ravel does not. He reminds us of things we would prefer to forget - first and foremost of our obeisance to Stalin. Yes, ours, not his. I have on my desk the programme for a Sunday afternoon concert given by the BBC Symphony Orchestra and Sir Adrian Boult "in honour of Stalin's birthday". The date is 21 December, 1941, and the main item on the menu is Prokofiev. I have other papers of that period in which Walton, Bliss and Malcolm Sargent are cheerily serenading Stalin. The whole of Western civilisation went doolally for a smile from Uncle Joe and, as Martin Amis justly contends, has never admitted its guilt in inflating the monster's megalomania. Prokofiev, by dying with Stalin, is buried with him in our collective subsconscious. We avoid most of his music because of the associations it evokes, and the Russians treat it circumspectly because the evil is still alive. Half a century on, it ought to be possible to detach Prokofiev from his times but history is a fluid topic, rewritten day by day. Tikhon Khrennikov, 90 years old this summer, is going around Moscow denying that he persecuted composers for anything other than financial crimes. Prokofiev, he insists, never suffered at his hands. In February 2003, Vladimir Putin awarded Khrennikov the presidential prize, the state's highest honour. Prokofiev's silence speaks volumes.